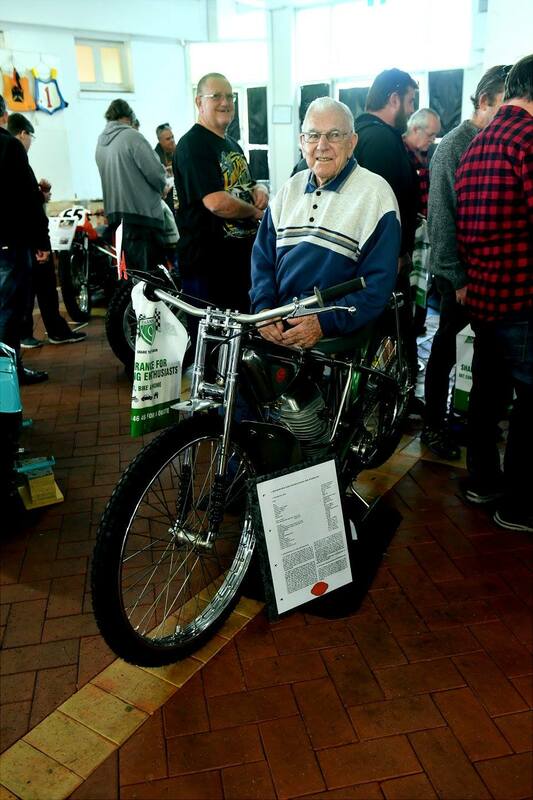 In or around 1990 the Vintage Speedway movement in West Australia did not exzist as the well organised association that it is today, Put simply a handful of guys set about restoring some old machines, Bob Oleary was one of those, Bob an ex solo champion from the golden days of Claremont Speedway, set about restoring some old solo bikes, Also Mick Thomson a long term car builder and spanner man for speedcar drivers such as, Charlie West and Richard Bellem. 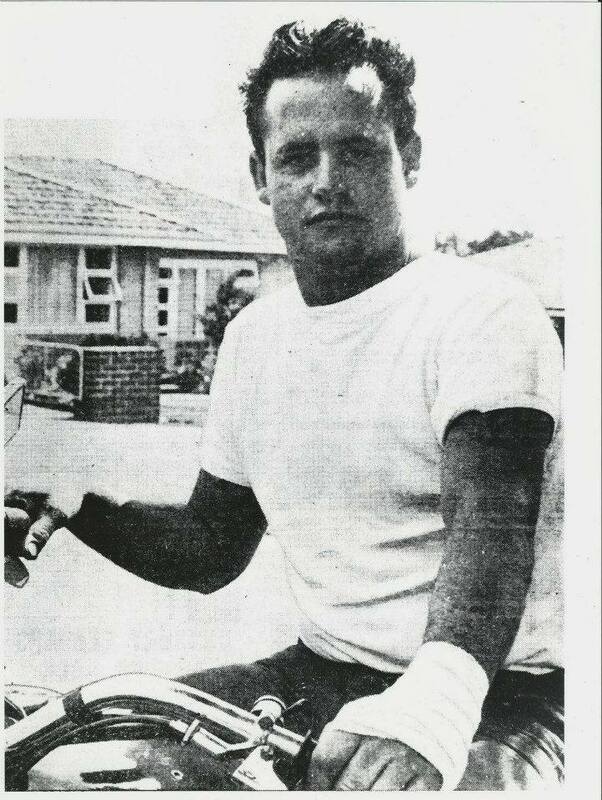 Both Bob and Mick seemed to inspire others to follow, During this period informal gatherings were held at Bobs workshop and as the group grew the meetings were moved to the Carlyle Pub. 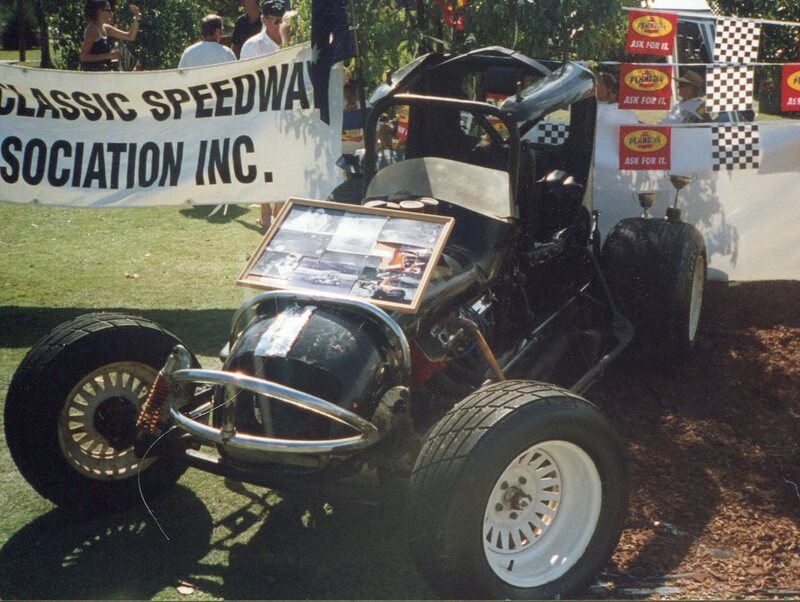 By 1994 the WA Classic Speedway Association inc was formed and the movement has prospered ever since. 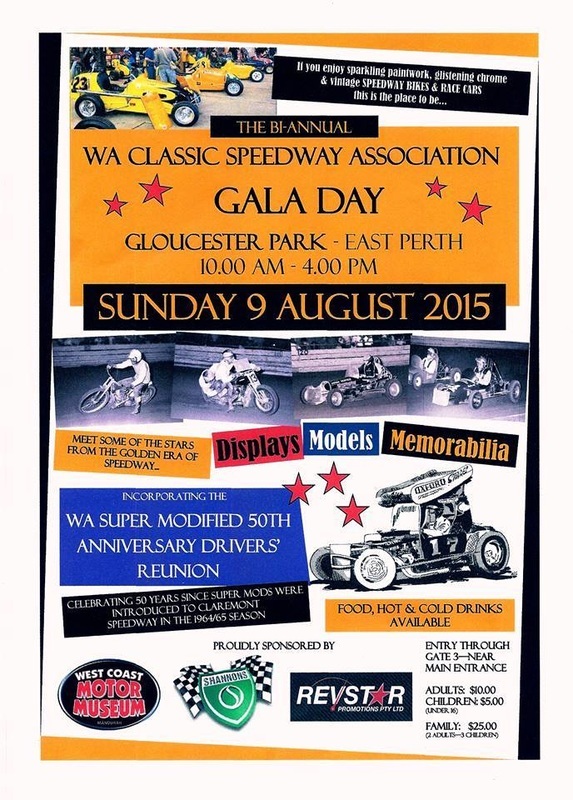 The West Australian Classic Speedway Association (WACSA) was formed in 1994 by a small group of enthusiasts who had an interest in preserving the speedway history of West Australia, At this time speedway was undergoing a number of transitions and there was a concern that bikes cars and information would be lost or destroyed, They were successful and today the club has over eighty members with a number of bikes and cars available for display or demonstration. 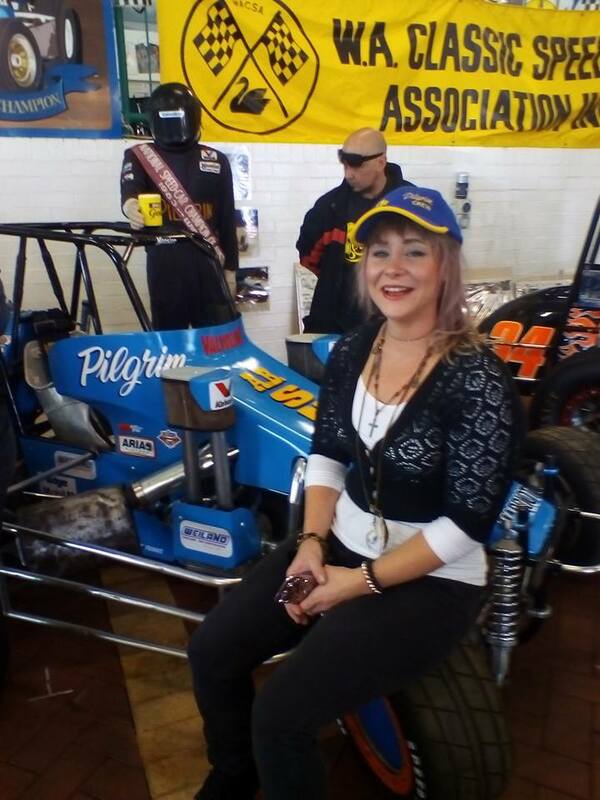 The prime objectives of the club are; To promote and encourage the preservation of speedway machinery of yesteryear; To present to the public authentic vehicles; To compile the history of speedway. 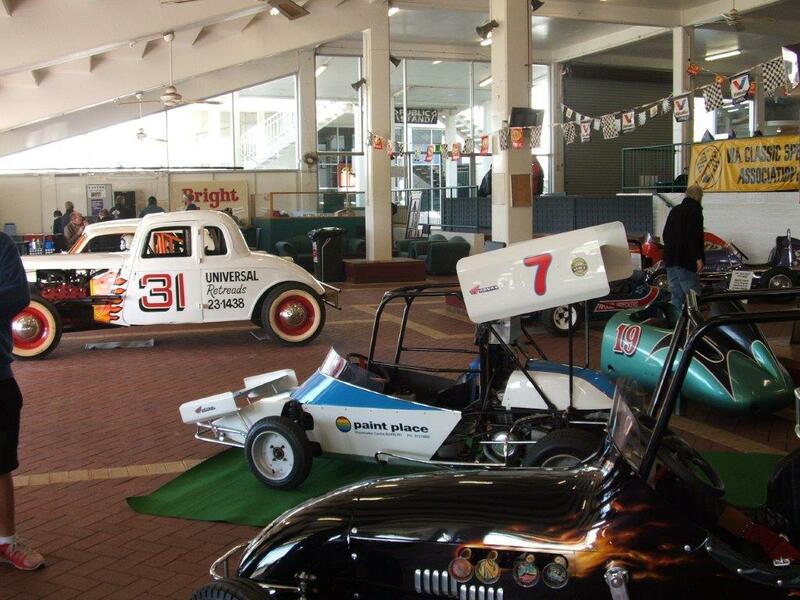 Membership of WACSA is open to anyone who has an interest in historic speedway, It is not necessary to have owned or driven a speedway vehicle, just an interest in preserving our speedway history, For those that may wish to own a bike or car, a little patient searching can find something to restore. 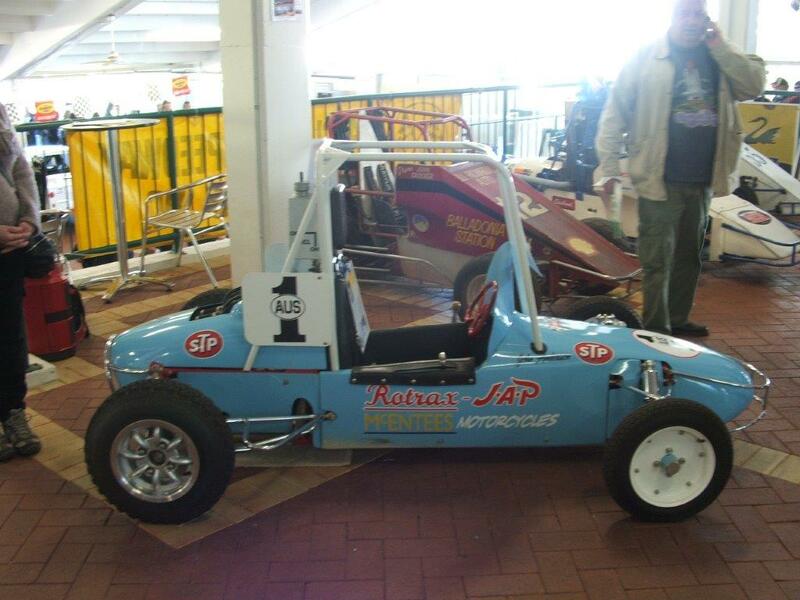 Where it is known a vehicle has been lost or destroyed the club will permit, under strict guidelines, the build of a replica, this will enable the public to see vehicles that may have a unique place in speedway history but would otherwise be lost. 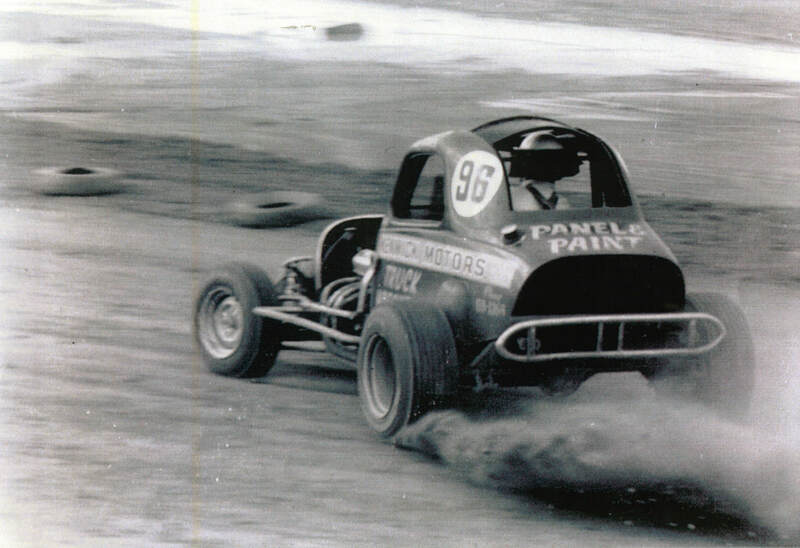 WACSA members are invited to many of the country and interstate speedways to give spirited demonstrations of their vehicles, within the club there is a Code of Conduct to ensure that demonstrations are safe and orderly, Any transgression of these rules can see the offending person watching the rest of the meeting from the pits. 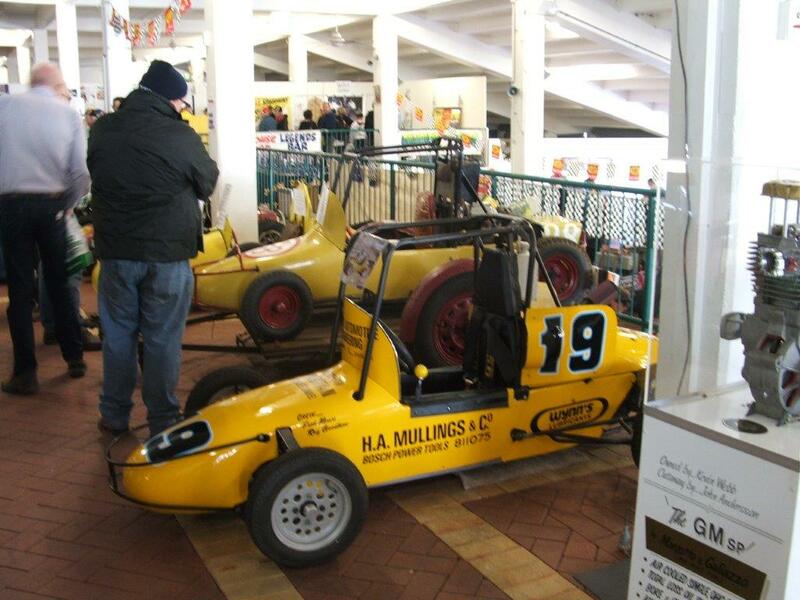 The club participates in numerous static displays for school fetes, motorshows etc, Members are able to display their vehicle and speak to members of the public about their piece of speedway history. 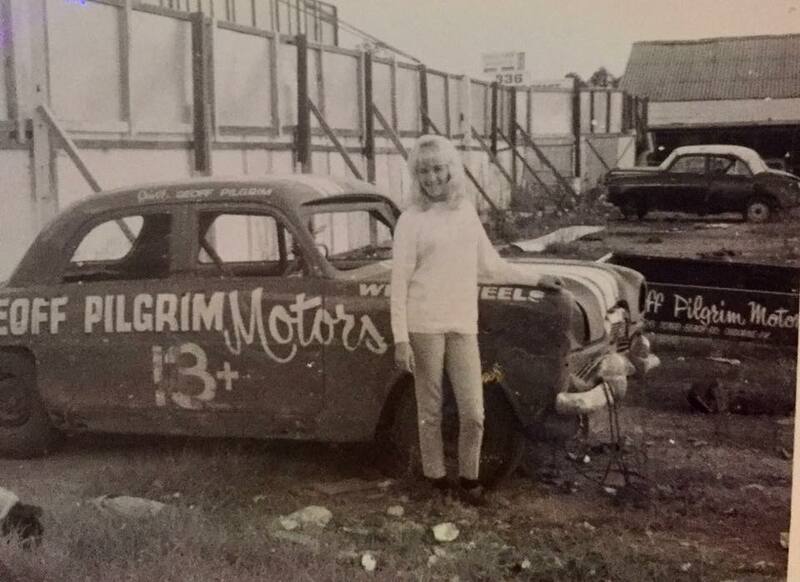 The club is always eager to find items or relics of the speedway history, this can include personal stories, film, photos, old programs, magazines, bikes and vehicles, If you are able to assist with any information, please contact John Pearson or Vince Maher. 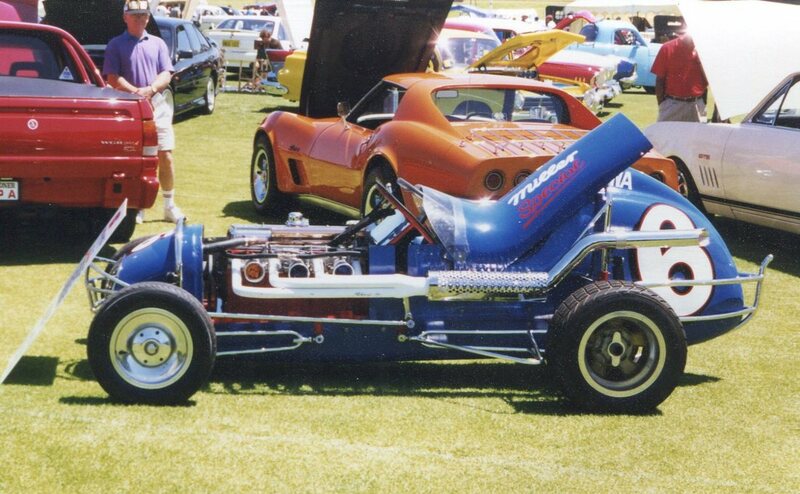 The restoration of the Kenwick Motors super modified was carried out by Mike and Tim Hall in the early 1990's and is still part of the Hall family legacy, In the 1960's Scott Robinson raced the car at Forrestfield Speedway then John Dicherra for a time until Ted Jones raced it at Forrestfield and Claremont. 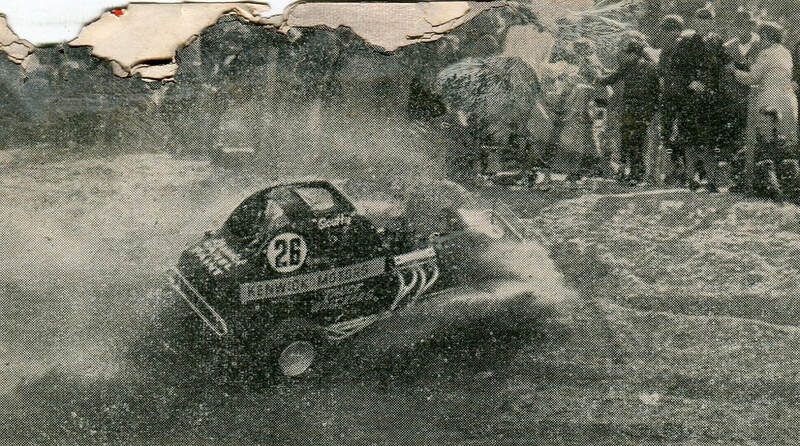 1969 - Scott Robinson scatters the crowd. 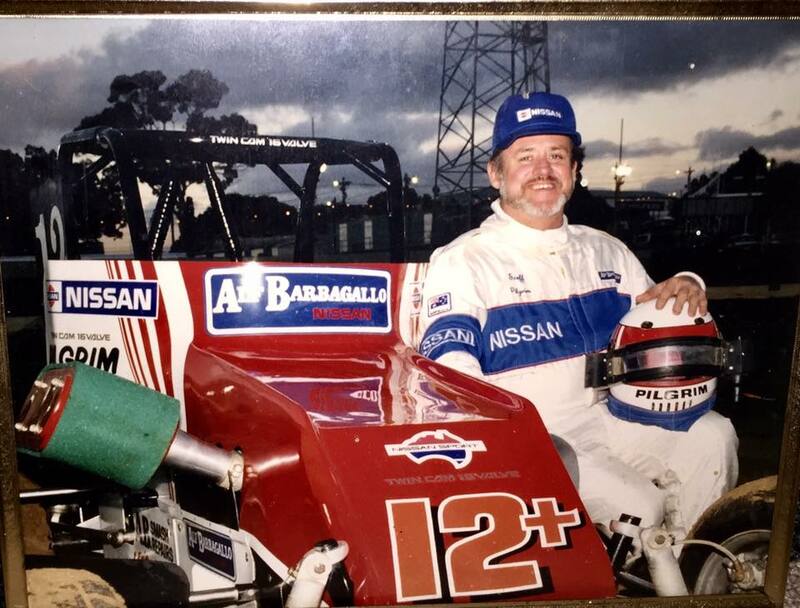 Photo: Australasian Road & Track. 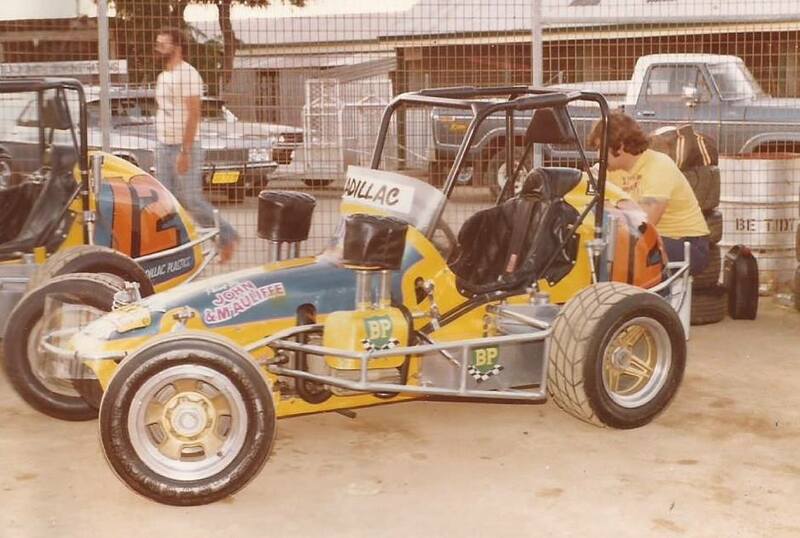 1975 - Ted Jones at Forrestfield. Photo: Peter Roebuck. 2013 - Photo: Brian Moyle. Well done team: a great event. BM. 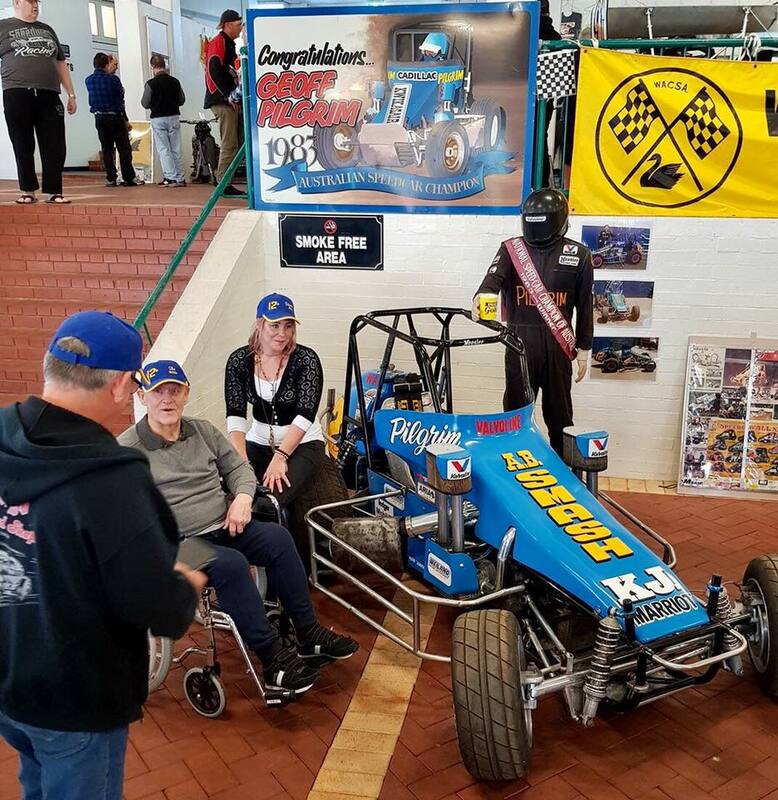 The WA Classic Speedway Association held its annual Gala day at the Cannington Greyhound complex on the 15th of September, The displays were fantastic with a wide range of quality solos, sidecars, tq's, speedcars, supermodifieds, and sedan. 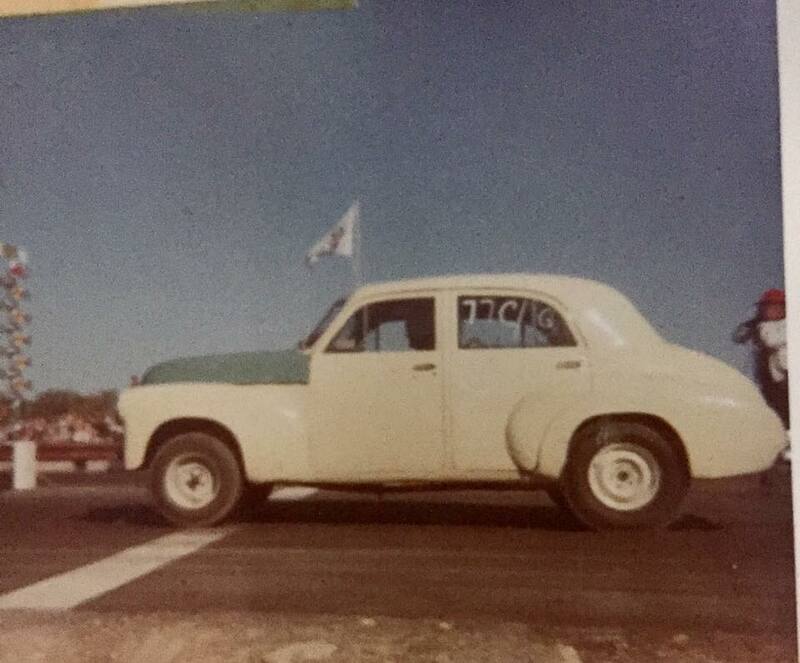 Along with the static display of vehicles, members of the association also provided plenty of scrap books, photo albums, programmes and magazines to go through. 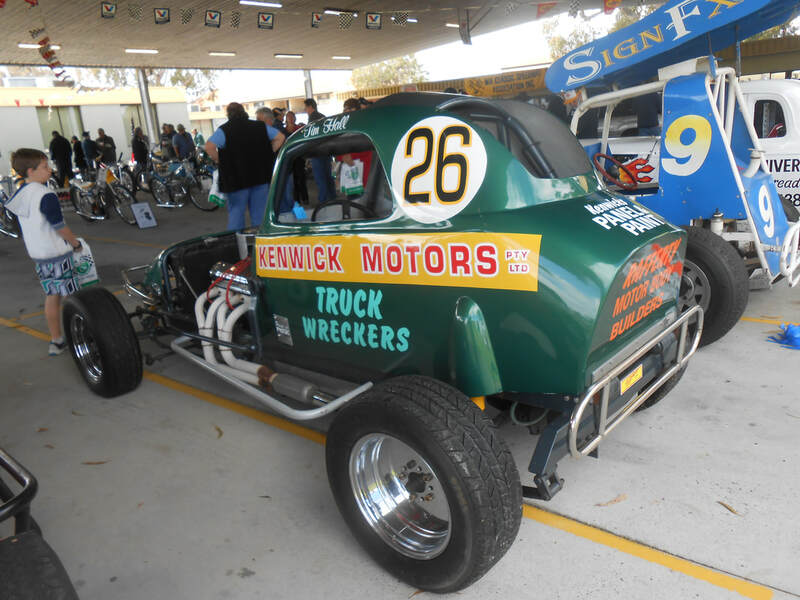 Allan Barton brought along his scale model collection of speedway cars, some built from scraps and very accurate in detailing. 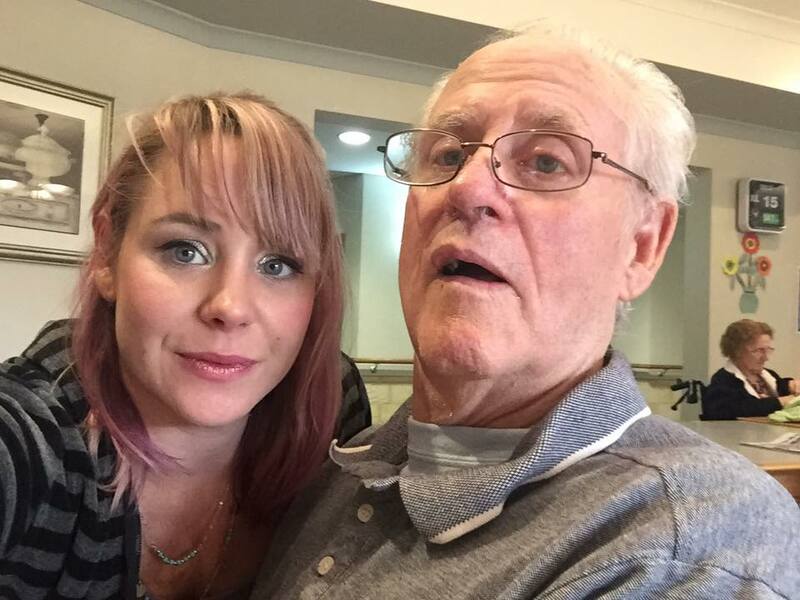 Former newspaper cartoonist Rod Waller had some of his artwork on display. 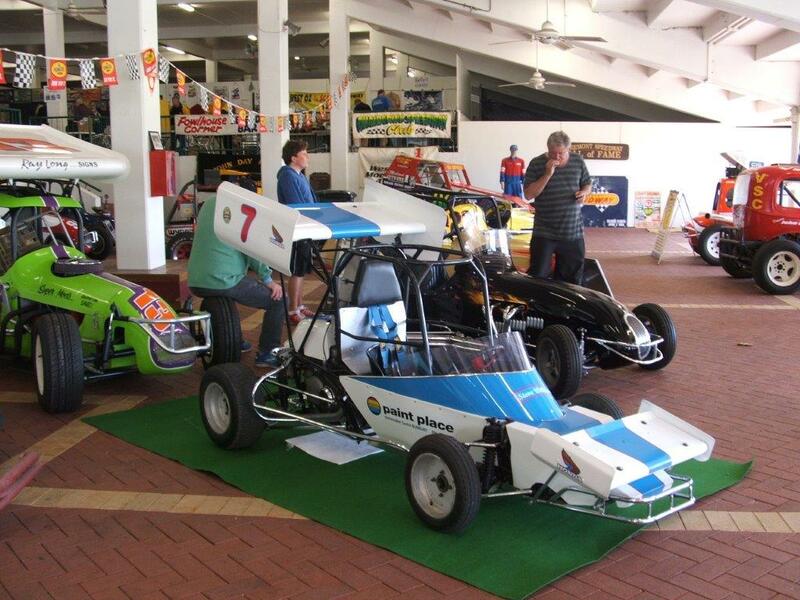 The Figliomini family had the magic mans transporter and speedcar on display, this display was a real show stopper. 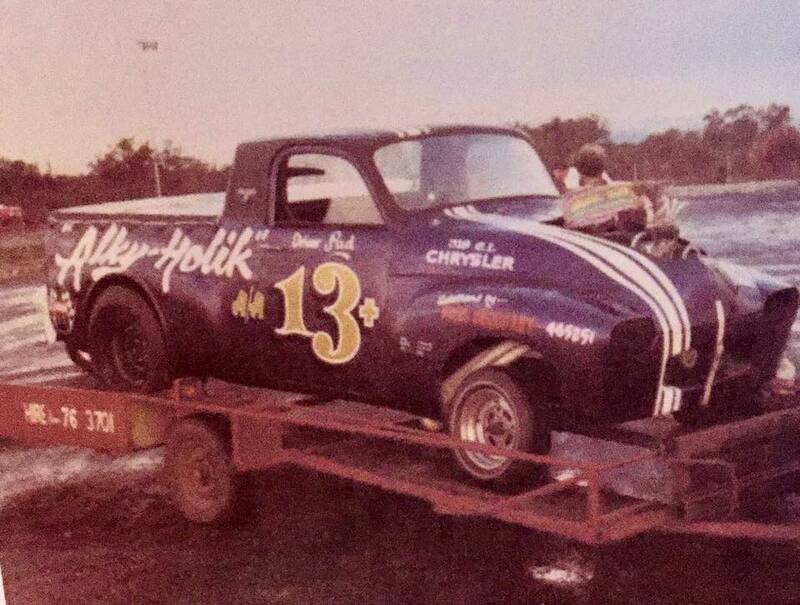 Best of all many of the stars from yester-year Don Hall, Ray Geneve, Bill Broadwood just to name a few were in attendance. 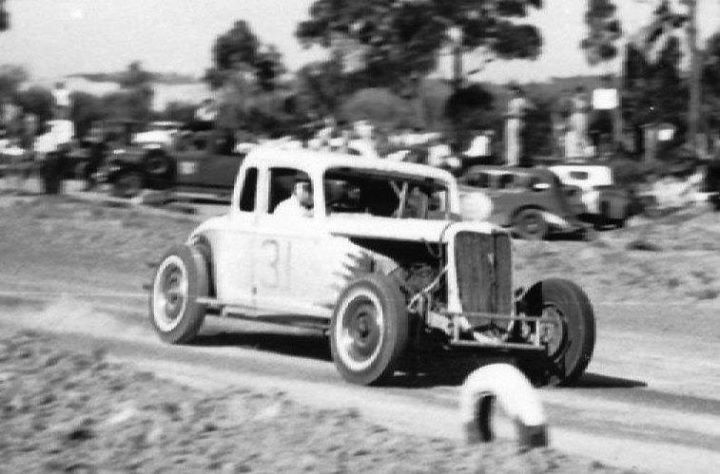 Now an annual event after its inception, the Forrestfield Speedway reunion is an event that is looked forward to by many. 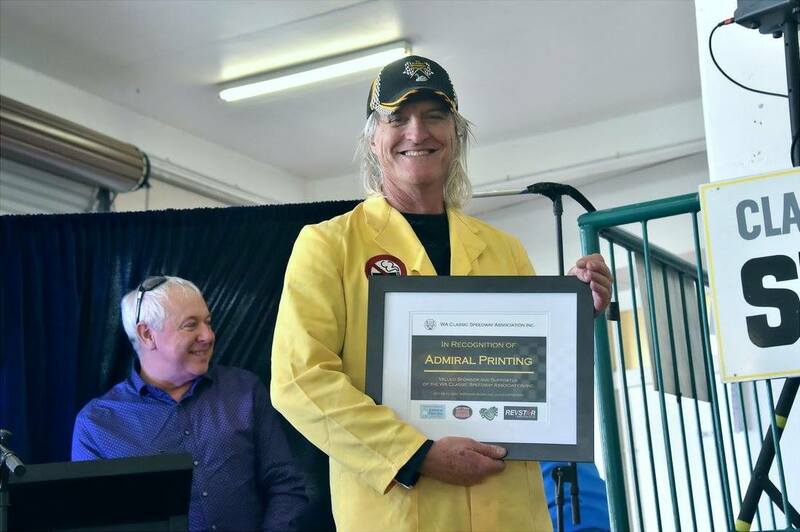 The annual event is held at the sensational suuoundings of the West Coast Motor Museum at Stakehill near Mandurah in West Australia. 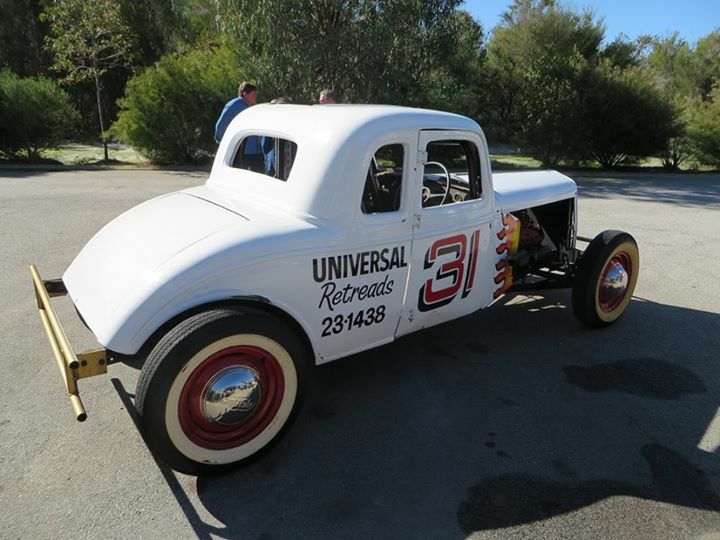 Ron West is the owner of the West Coast Motor Museum and as an ex racer wants to remind everybody of the past, Rons collection includes many speedcars as well as his rebuild 1934 Ford Coupe that he raced at the Forrestfield track. 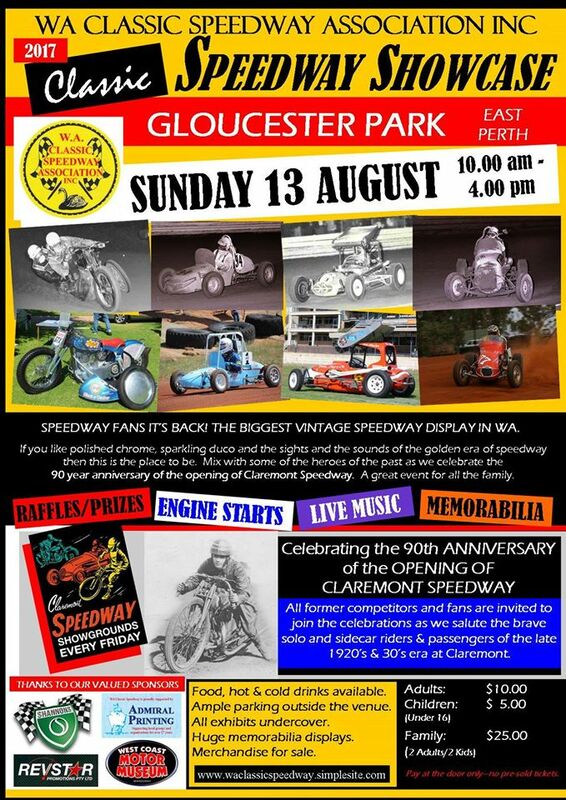 Yet another incredible day out at Glouster Park for speedway fans, The displays were of a very high standard an increasing in numbers, A tribute to Drag racer and Speedcar ledged Geoff Pilgrim was the highlight of the day along with the in-vailing of the Laurie Hardie freshly restored Holden Monaro, with Laurie in attendance, many other past drivers and riders attended, all super stars in there own right. Roll on 2018. 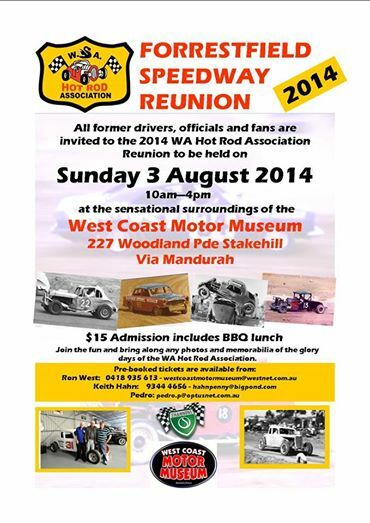 The WA Classic Speedway Association always manage to pull off an incredible feature at the Showcase each year, This year they paid tribute to on of the greatest speedcar drivers in Australia, that being our own West Australian driver Geoff Pilgrim, Geoff has been doing it a bit tough lately with a few medical issues, but with help from his mates Hairy and Junior and daughter Anna, Pillsy managed to turn up for his dedication and greet many of his fans over the course of the day.